WE BELIEVE THAT EVERY ENVIRONMENT CAN BE ENRICHED BY NATURE. 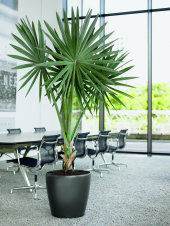 Plants bring a natural beauty to both indoor and outdoor atmospheres. By creating texture and providing balance to designs, plants can easily transform any space into a warm and inviting environment. Aside from being aesthetically pleasing, plants provide other benefits. Plants have a calming affect which can help relieve stress. They also have been known to help boost productivity, creativity, and problem solving. Here at NewPro, our goal is to provide industry professionals all the resources necessary to help keep the world we live in beautiful despite rapid economic development. "Nature is not a drag on growth. Its protection is an unavoidable prerequisite for sustaining economic development."